Prior to conducting the survey, Pew Research Center conducted a qualitative test with nearly 200 men who were asked to list some traits and characteristics that come to mind when they think of a man who is manly or masculine and nearly 200 women who were asked what comes to mind when they think of a woman who is womanly or feminine. While these terms can have different meanings for different people, the qualitative testing revealed that respondents tended to associate “manly or masculine” with a common set of descriptions that relate to strength, confidence and certain physical traits. Some commonly used words included “strong,” “assertive,” “muscular,” “confident,” “deep voice” and “facial hair.” When it comes to traits and characteristics used to describe women who are “womanly or feminine,” some frequently used terms included “grace” or “graceful,” “beauty” or “beautiful,” “caring,” and “nurturing.” Many people also mentioned wearing makeup and dresses. Similarly, Democrats and Democratic-leaning independents are far more likely than Republicans and those who lean to the GOP to say gender differences are mostly based on societal expectations rather than on biological differences between men and women. 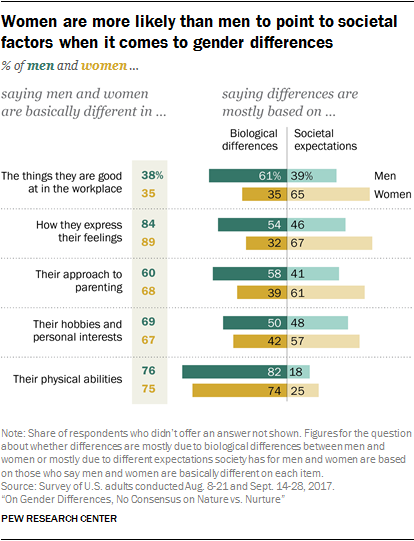 About two-thirds of Democrats who say men and women are basically different in how they express their feelings, their approach to parenting, and their hobbies and personal interests say these differences are rooted in societal expectations. Among their Republican counterparts, about four-in-ten or fewer share those views. Millennial men stand out from their older counterparts in three of these areas: 69% say there is at least some pressure on men to be willing to throw a punch; 55% of Gen X and 53% of Boomer men and even smaller shares of men in the Silent Generation (34%) say men face pressure in this regard. And while about six-in-ten Millennial men say there is at least some pressure on men in general to have many sexual partners (61%) and to join in when other men are talking about women in a sexual way (57%), about four-in-ten or fewer older men say men face at least some pressure in these areas. While the question asked about pressures men face in general, it is possible that respondents were drawing on their or their friends’ personal experiences when answering. As such, the generational gaps in views of how much pressure men face in these realms may reflect, at least in part, their age and their stage in life. About six-in-ten Democrats and Democratic-leaning independents (58%) say most people in our society these days look up to men who are manly or masculine, while 4% say society looks down on these men and 37% say it neither looks up to nor down on them. Among Republicans and those who lean to the Republican Party, 47% say society looks up to masculine men; 12% say society looks down on them and 41% say neither answer applies. Republicans who say society looks up to masculine men overwhelmingly say this is a good thing (78%). 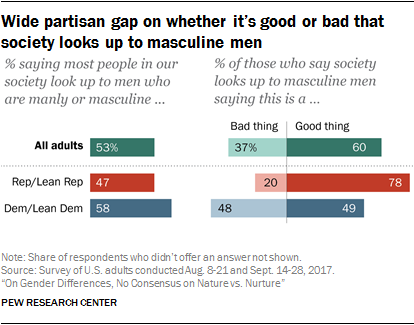 Democrats aren’t convinced: Among those who say society looks up to masculine men, almost identical shares say this is a good thing (49%) as say it is a bad thing (48%). While smaller shares of Americans say most people in our society look up to feminine women than say most people look up to masculine men, a solid majority of those who say society looks up to women who are feminine (83%) also say this is a good thing; just 15% say it’s a bad thing that society looks up to feminine women. Overall, 60% of those who say most people look up to masculine men see this as a good thing, while 37% say it is bad. Men and women give similar answers when asked to describe themselves in terms of their own masculinity or femininity. About three-in-ten men (31%) say they are very manly or masculine, while 54% describe themselves as somewhat masculine and 15% say they are not too or not at all masculine. Among women, 32% say they are very womanly or feminine, 54% say they are somewhat feminine and 14% say they are not too or not at all feminine. Black men are more likely than white men to say they are very masculine, and the same pattern holds for women. About half of black men (49%) and black women (47%) describe themselves as either very masculine or very feminine, compared with 28% of white men who say they are very masculine and 27% of white women who see themselves as very feminine. While about a third of men and women without a four-year college degree say they are very masculine or feminine (34% each), smaller shares of those who have a bachelor’s degree or more education describe themselves this way (22% and 24%, respectively). The survey also finds a wide generational gap in the way women see their own femininity. While about half (53%) of women in the Silent Generation say they are very feminine, about a third of Boomer (36%) and Gen X (32%) women and an even smaller share of Millennial women (19%) see themselves this way. There is no clear link between a man’s age and the way he sees his masculinity. Among men, Republicans are more likely than Democrats to say they are very manly or masculine: 39% of Republican men – vs. 23% of their Democratic counterparts – describe themselves this way. And while 21% of Democratic men say they are not too or not at all masculine, just 8% of Republican men say the same. Views are more uniform across party lines when it comes to how women see themselves. Most adults are open to the idea of exposing young girls and boys to toys and activities that are typically associated with the opposite gender. About three-quarters (76%) say it’s a good thing for parents of young girls to encourage their daughters to play with toys or participate in activities that are typically associated with boys; a somewhat smaller majority (64%) says it’s a good thing for parents of young boys to encourage them to play with toys or participate in activities usually thought of as being for girls. 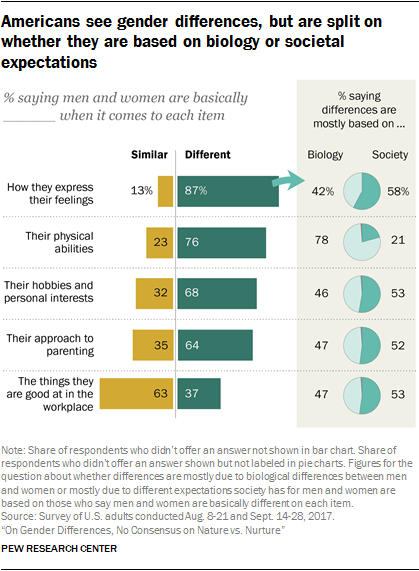 Women are more likely than men to say parents should encourage their children to engage in activities that are typically associated with the opposite gender, but the difference is more pronounced when it comes to views about raising boys. Large majorities of women (80%) and men (72%) say it’s a good thing for parents of young girls to do this; 71% and 56%, respectively, say parents of young boys should encourage them to play with toys or participate in activities typically associated with girls. Democrats and Democratic-leaning independents are more likely than Republicans and those who lean Republican to say it’s good for parents to break with gender norms in raising children, and here, too, the difference is most pronounced when it comes to raising boys. About eight-in-ten Democrats (78%) – vs. 47% of Republicans – say it’s a good thing for parents of young boys to encourage them to play with toys and participate in activities typically associated with girls. References to Millennials include adults who are ages 18 to 36 in 2017. Generation Xers include those who are ages 37 to 52, Baby Boomers include those who are 53 to 71 and members of the Silent Generation include those ages 72 to 89.